A regular feature of ENHG meetings and AGMs has been the plea for more records. However, in 1983 I was inundated with records of all shapes and sizes, some going back as far as 1962. Abu Dhabi has been covered more thoroughly than ever before with weekly records from Bish Brown and myself and daily records for several months of the year from Mike Crumbie. I have also received regular records from offshore observers as well as reports from individuals based in the Western Region. This increased number of records has led to the decision to record resident species as 'present throughout the year' instead of giving each individual sighting as was previously the case. It is important to continue to record numbers on the forms, however, so that any change of status can be noted. 1983 followed the regular pattern of bird seasons. The only significant change was the later spring migration with fewer migrants being recorded both onshore and offshore. A flock of Black-necked Grebes was recorded in Abu Dhabi in December: usually five could be seen. The same species was also sighted at Hatta Lake on various occasions throughout the autumn. In October four Little Grebes were recorded at Hatta. Petrels, probably Wilson's, were recorded in autumn offshore. Rather surprisingly I received no records of Tropicbirds last year. * Large numbers of Common Socotra Cormorants were recorded both onshore and offshore. Flocks of several thousand Socotra Cormorants were recorded off Umm Shaif Supercomplex in September and off Das in December. During the winter months flocks of several hundred Common Cormorants were seen flying over Abu Dhabi. All our common Herons and Egrets were recorded: Night Heron, Reef Heron, Little Egret, Great White Egret, Grey Heron, Little Bittern, Spoonbill and Purple Heron. Squacco Herons and Cattle Egrets were not seen in 1983. Up to eight Spoonbills were seen for several weeks from April through July. A Glossy Ibis was reported in November at Saffa Park in Dubai. Our regular Flamingo flock with numbers up to five hundred was present throughout the year. Three Egyptian Geese were recorded in April. The numbers of duck in the winter were not as high as in 1982 and consisted mainly of Teal and pintail. Egyptian Vultures in flocks of up to thirty abounded, particularly in the vicinity of Al Ain Zoo and Hafit. In Abu Dhabi Marsh Harrier, Pallid Harrier, Spotted Eagle, Short-toed Eagle, Osprey and Kestrel were all recorded from time to time. Saker Falcon and Lesser Kestrel sightings were received from other areas. 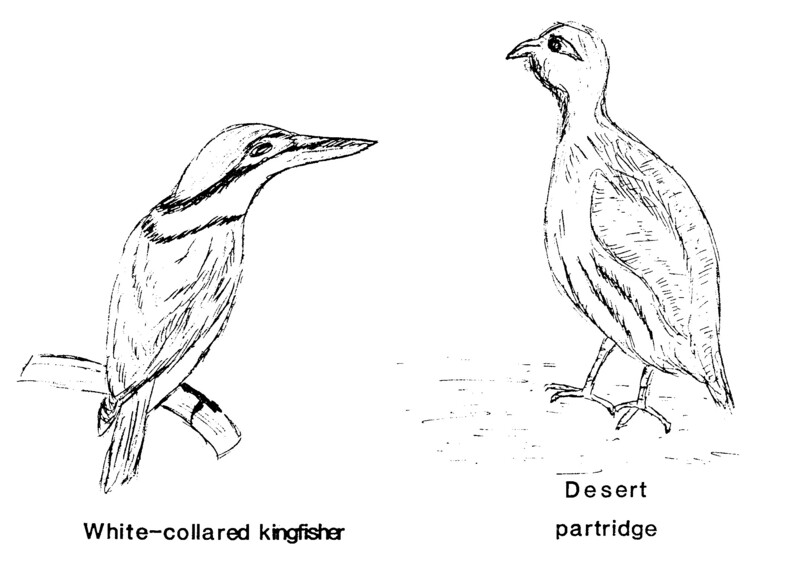 There were frequent sightings of Sand Partridges thoughout the year in the foothills of the mountains and around Al Ain. A solitary Coot was recorded in the winter at Mafraq and one at Ayn Al Faydah in January. A Coot and two Moorhen were seen at Hatta Lake in October. A Demoiselle Crane was present on the old Abu Dhabi airfield and in the Eastern Lagoon from late October until the end of December. The vast majority of our records fall into this category with most species being seen throughout the year, the largest numbers, of course, being recorded during the spring and autumn migrations. The most unusual records for 1983 included one Stone Curlew on Das in March, a flock of up to twelve Lesser Golden Plovers in the autumn and winter, the occasional Knot, Green, Wood and Terek Sandpipers, Oystercatchers, a dead Woodcock and small flocks of Black-winged Stilts. There were several records of Arctic Skuas seen preying on terns just outside the Abu Dhabi breakwater. Large numbers of our six regular species of Gull (Sooty, Black-headed, Slender-billed, Lesser Black-backed, Great Black-headed and Herring) were recorded onshore and offshore. Similarly many Tern records were received, an unusual one being three Black Terns at the Eastern lagoon in October. Lichenstein's and Chestnut-bellied Sandgrouse were recorded in the desert. Many sightings of Palm Doves and Ring-necked Parakeets were received. Rock, Collared and Turtle Doves were also present in 1983. Two Eagle Owls were recorded in a tree (Prosopis spicigera) in the sand dunes along the Abu Dhabi - Al Ain road. Our much photographed 'Abu Dhabi owl' is still under consideration by ornithologists here, in the Oman and in the U.K.
Pallid Swifts, Common Kingfishers, Blue-cheeked, Little Green and European Bee-eaters, Indian and European Rollers were all recorded during the migration periods, although many of these species are now resident throughout the year. There were spring and autumn records of Hoopoes and Swallows although the latter were often recorded as solitary or in small groups of twos and threes. Pale Crag Martins were often seen in the mountains and there were many sightings of Crested, Desert and Hoopoe Larks. Large flocks of seventy or more Red-throated Pipits were seen in April on the grass verges in the city. Records of Tawny, Meadow, Water and Long-billed Pipits were also received. We had our usual large numbers of Yellow and White Wagtails and assorted sightings of Common and White-cheeked Bulbuls. Stonechats, Bluethroats, Rufous Bushchats, Black Redstarts and eight species of Wheatears were recorded. The rarest records in this section were of four Robins reported in early November offshore on a diving ship, on Das, Zakum Supercomplex and at Jebel Dhanna. The dates suggest at least three separate birds. Song, Mistle, Blue-rock and Black-throated Thrushes were reported. The most common Warbler to be seen throughout the year in Abu Dhabi and breeding was the Graceful prinia, while in desert areas Lesser Whitethroats and Desert Warblers were most often recorded. Spotted Flycatchers and Arabian Babblers were recorded in regions outside Abu Dhabi town. They only Sunbird seen locally, the Purple, seemed to be increasingly common in parks and gardens throughout the city. We received only one record of a Masked Shrike, the most common Shrikes being Isabelline and Great Grey. Records of House Crows and Brown-necked Ravens came from the east coast and desert regions. Small parties of Starlings were recorded in Abu Dhabi in the autumn and winter. Common Mynahs and House Sparrows continue to multiply throughout the Emirates. Pale Rock and Desert Sparrows were seen at Hatta and Al Ghayl. Indian Silverbills were reported from the Al Ain area. There was a solitary Trumpeter Finch at Jebel Qatar in February and a record of six very disappointed-looking Corn Buntings on Das Island in April. In later summer 1983 the ENHG received a most interesting request from the Academy of Sciences of the Latvian Soviet Socialist Republic to watch out for White Storks since they were engaged on a study to plot the migration of thirty birds that were specially marked and released in October, a month later than the usual migrating period for the species. Abu Dhabi is clearly on the end of their possible range since they normally migrate through the eastern Mediterranean. The White Stork has been rarely recorded in the past but, alas, not in 1983. We also recorded a letter from Michael Gallagher of the Ministry of National Heritage and Culture in Oman, with information on the Lappet-faced Vulture seen on Jebel Hafit. Hopefully we shall establish regular communications with the Group there and receive information on the bird life of Oman on a steady basis. 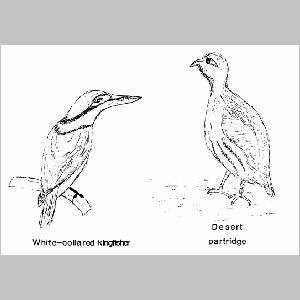 * Tropicbirds were reported nesting in numbers on Qarnain and Zirku Islands in March 1984. -- Ed.